Your desktop maybe full of icons. You need to spend at least 10 seconds to find the application you want to run, or 5 seconds to find the work-in-progress document. Look no further on an easy solution. 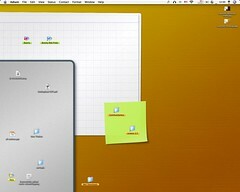 Gabriel Radic has came up a great idea to organise your icons on desktop in groups, by using a wallpaper. You can use it to organise your icons in groups, just like how you organise your desk. There is a paper area for your work-in-progrss stuff, an aluminum plate for personal projects, a wooden desk yet-to-be-categorized stuff, and post-it for high priority items. Download the wallpaper and set it as your desktop background. Make sure you use centered layout.